This product is the best quality true amber colloidal silver. It is produced using only steam distilled water and elemental silver and contains a wide range of silver particle sizes which gives it its reassuring distinctive amber colour. Colloidal silver MUST contain silver particles. 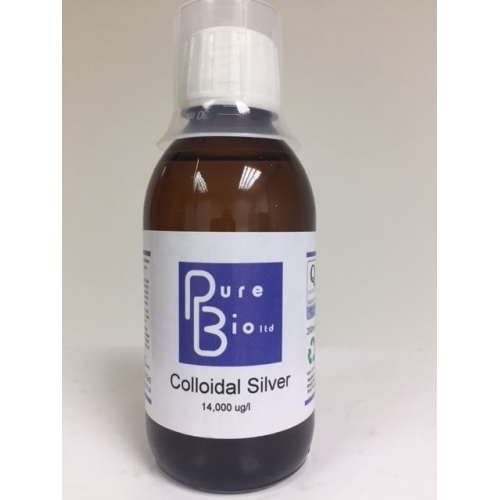 However, most colloidal silver solutions found on the market are predominantly clear (ionic) silver water, with little or no actual silver particles. This product contains our 14,000 ug/l True Amber Colloidal Silver that has been tested by Eurofin Laboratories & assessed by Plymouth University for nanomaterial characterisation & batch consistency, as required by EC1223/2009. This product has been screened by a WADA approved laboratory to ensure it is free from prohibited substances. Upper safe daily limits of colloidal silver depends upon a number of factors, including body weight, overall health, and even antioxidant levels. 3) This will tell you how many DROPS of colloidal silver you can take each day, safely, for a lifetime, without fear of ending up with argyria (i.e., skin-staining). If you are pregnant or lactating, have any health condition or are immuno-compromised, or are taking any medication, consult your practitioner before use.